New Canaan coach Rich Bulan. NEW CANAAN—Last spring, Rich Bulan found himself sitting on a bucket of balls at a New Canaan softball practice, sulking. 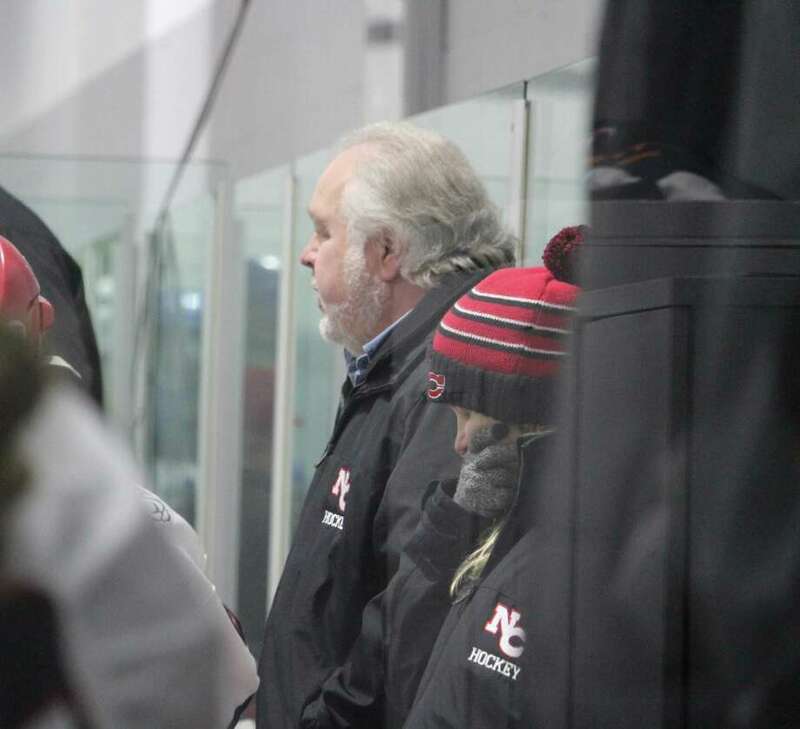 The storied girls hockey coach, who moonlights as an assistant softball coach, was just told by his goalie, Amanda Hill, that she would be leaving the program. While he understood her decision, it meant that as of that moment, he was heading into the 2016-17 season with literally no option in net. Fahey, a then freshman, had just made the jump from baseball to softball to play for the Rams, and looked to console a visibly upset Bulan. Fahey’s goalie experience to that point had been—in a word—limited. Growing up, she would don catcher’s equipment while her brother and her neighbor, All-State defenseman Jess Eccleston, fired shots at her. Desperate, Bulan was willing to give her a shot. The coach arranged for her to come to the SoNo Ice House in Norwalk to put her through an initial observation. That preliminary tryout got off to a rocky start. Joining Fahey and Bulan were New Canaan stars Brooke Deane and Gianna Bruno. Deane and Bruno started off taking fairly reserved shots at the undeveloped Fahey. But, as Bulan recalls, the pair started getting frustrated with Fahey’s ability to stop even their most powerful shots. The next step was to develop her fundamentals. Because of her size and her already strong glove hand, Bulan wanted her to adapt a butterfly-style of goaltending—one in which the goalie drops low to protect the net and relies on their glove to make up for their limited mobility. Fahey started taking weekly lessons at the SoNo Ice House, and by time the season arrived, Bulan had his starting goalie. Fahey played every game in net for New Canaan, growing both physically and mentally as the year wore on. As the season progressed Bulan advised her to take advantage of both YouTube and simply watching opponent goaltenders to advance her style and knowledge of the position. She followed his orders to the letter. As important as her studying, was her competitive nature. While her confidence in her ability bloomed, she felt an extra boost to prove herself to girls that had been playing their entire lives. As is the case with any athlete, especially one breaking ground in a new sport, Fahey’s support system was the foundation of her development. The sophomore credits both the team atmosphere, as well as Bulan’s coaching style, with fueling her new found passion for the game. Bulan, whose attitude towards his girls is that of family, not just player, couldn’t be more proud. Not just because of her success on the ice—garnering second-team All-FCIAC honors—but because of her willingness to work hard off it. And with two years remaining her high school career—and still plenty of untapped potential—don’t expect to see Bulan sulking on the bench anytime soon.